For Mexico's state oil giant, the expansion of organised crime into fuel theft is a growing menace. Now, a bungled attempt to illegally tap an oil pipeline has threatened an environmental disaster in the northern state of Nuevo Leon, after an estimated 4,000 barrels of crude oil poured into the San Juan River. The alleged failed theft on August 16 caused an oil spill of up to 15 thousands tons, according to the national oil company, Petróleos Mexicanos (Pemex). The slick has already advanced five miles, authorities say — and it is feared that rain forecast for the coming days and weeks will spread the contamination further. Mexico topples oil theft ring, but cartel threat still lingers over state-owned petroleum company. Read more here. The influx of rainwater could send the pollution downstream towards El Cuchillo dam, which provides drinking water to Mexico's third most populated city, Monterrey. The city's primary water supply, El Cuchillo — which also used for crop irrigation — is just 30 miles away from the contaminated site. It is estimated that the oil has already spread five miles from the site of the spill. Local authorities say the first to be affected will be the roughly 4,000 inhabitants who live in the area surrounding the pipeline, a rural region where cattle raising and agriculture are the primary means of sustenance. Experts have yet to assess the damage to the local environment. The area is one of high natural biodiversity, teeming with plant and wildlife. During the fall, the regional dams become estuaries for migratory birds, several species of ducks, cranes, and herons, as well as endangered species like the black bear and American puma. In a press release published on Wednesday, Pemex said that more than 500 people were working in the area to contain the damage, claiming that since the spill was discovered, 90 percent of the oil had been retrieved. Last Monday, Pemex said the leak had been contained, and estimated their efforts at the site would be finished by the beginning of this week. 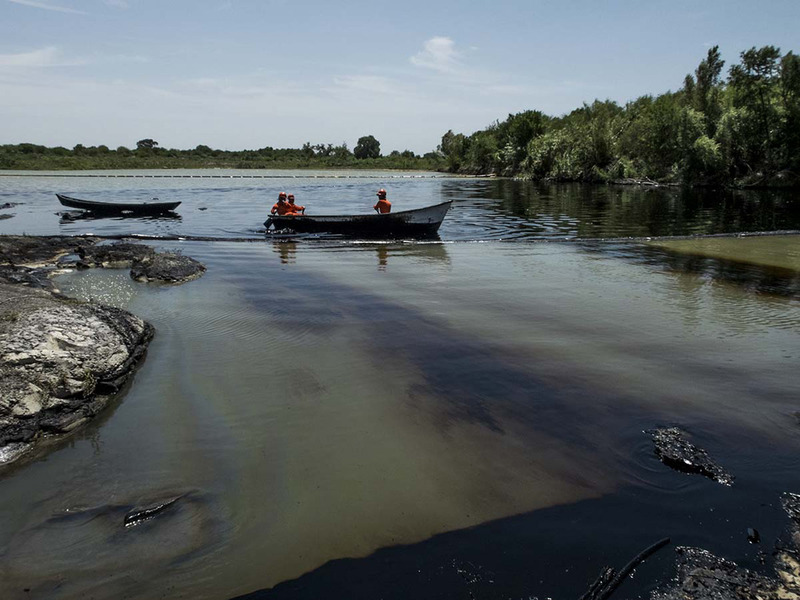 But Mexico's National Water Commission (Conagua) is gauging the cleanup that will come after the oil is removed. Conagua estimates the work will take up to three months. Petroleum absorbent barriers have been put in place to impede the oil's progress, and machinery has been brought in to suction the fuel that is lying on the water's surface. The San Juan River is the second in Mexico to be polluted this August. Last Monday, the largest mining corporation in Mexico had a scare when a train carrying 240 tons of sulphuric acid derailed just yards from the edge of the Santa Cruz River, in the border town of Nogales, Sonora. The derailment did not lead to a major spill. But, less than three weeks before, on August 6, this same company, Grupo México, spilled more than 10 million gallons of copper sulphate acid solution into two other northern rivers, the Sonora River and the Bacanuchi River. Locals near the spill have reported severe chemical burns upon contact with the water. The Madero-Cadereyta pipeline which leaked into the San Juan River runs through a region commonly exploited by Mexican criminal organizations, specializing in oil theft, and black market fuel sale. These activities are becoming commonplace. On December 2010, 30 people died during an explosion that was fed by spilled combustible, stemming from an illegal siphoning operation in San Martín Texmelucan, Puebla. Clandestine tapping and illegal siphoning of oil ducts is an ever-increasing problem in Mexico. The recent VICE News documentary "Cocaine & Crude" revealed that between 2000 and 2013, oil and gas theft from Pemex increased by over 1,500 percent. It is now thought that upwards of 10,000 barrels are stolen in Mexico each day. A Mexican journalist was murdered after reporting a fugitive police chief's ties to large-scale oil theft. Read more here. Oil theft is big business in Mexico, and cartels have been progressively venturing into this profitable informal industry, which is a notch more sophisticated than their usual endeavours: kidnapping, extortion, and drug trafficking. In 2013, the lost profit for PEMEX resulting from such activities was estimated at more than half a billion dollars. The general director of Pemex, Emilio Lozoya, who is reportedly supervising the cleanup effort himself, stated that this leak has cost the company more than $11 million in earnings. Besides the temporary loss of revenue for both the drug cartels and the Mexican government resulting from this massive leak, residents are concerned that the most significant lasting consequence will prove to be environmental in nature.